Move over Charles Perrault, there's a new fairy tale king in town. His name is Evan, and he's officially the most adorable child on Planet Earth (well, technically he's in 4th place behind my three children, but that's still pretty good). 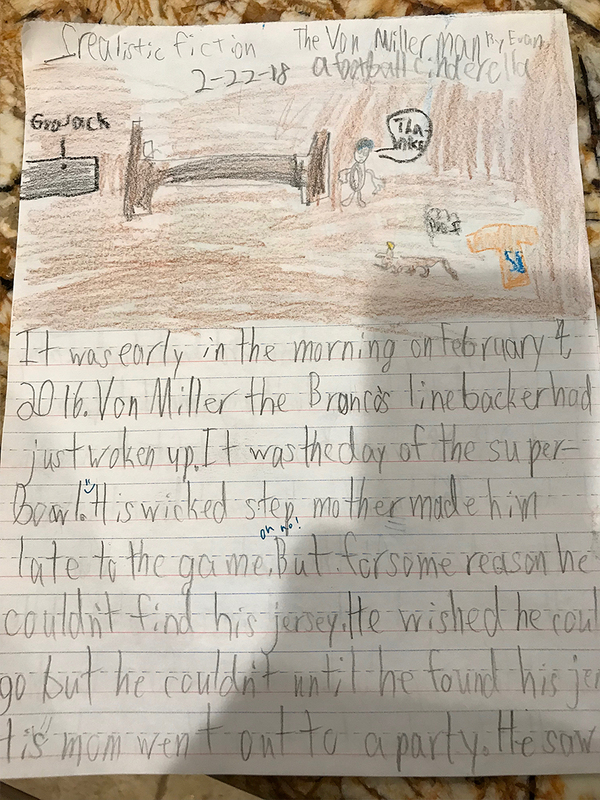 His second grade assignment was to write a realistic fictional story, and being the Good Ag that he is, Evan decided to pen pencil the most creative Von Miller-related fairy tale we've ever laid eyes on: The Von Miller Man, A Football Cinderella. There's no grade written on the paper, perhaps because you can't give an A++++++++++ without making the other children feel terrible about their subpar work. If I were his teacher, I would have given him the above grade, immediately dismissed the class Reveille-style, and called it a day. A++++++++++ work, Evan. And thanks to the loyal TexAgs subscriber that allowed us to share it with the world. It was early in the morning on February 4, 2016. Von Miller the Bronco’s linebacker had just woken up. It was the day of the super-Bowl. His wicked step mother made him late to the game. But for some reason he couldn’t find his jersey. He wished he could go but he couldn’t until he found his jersey. His mom went out to a party. He saw a fairy rat. The rat gave him 3 wishes. But there is something I didn’t tell you: Von’s mom told him she wanted the house to be spot-less when she got home. He used one of his wishes for the house to be clean. He used his 2nd wish to find his jersey. He used his 3rd wish for a fancy sports car. He drove to the game. It was tied 28-28 with 5 seconds left. He was on defense. The panthers threw it down the field to the end zone. At the last second Von Miller jumped out and intercepted it. He ran all the way into the end zone for a touchdown. He flung his helmet into the crowd. A lady found it. The next day the lady went around town looking for Von. 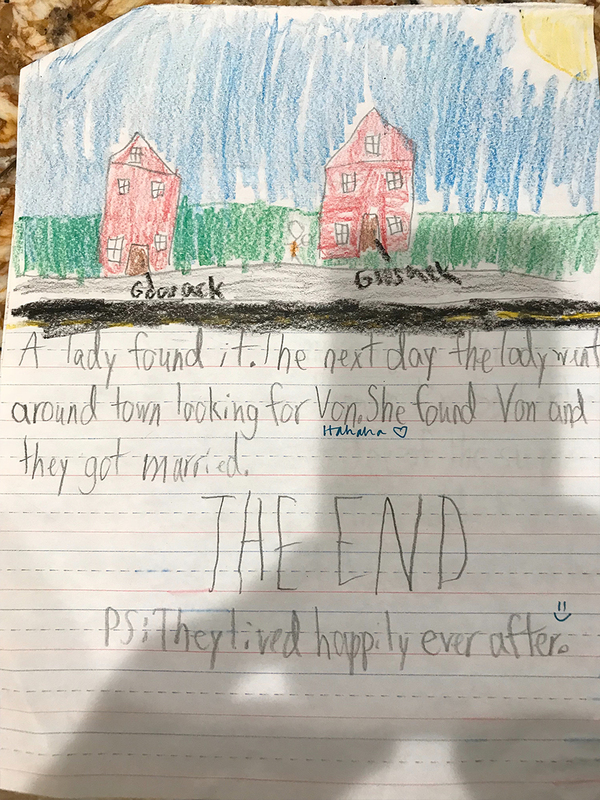 She found Von and they got married. PS: They lived happily ever after. And that's exactly what we're gonna do to 'em, Ags!!! Wow... That kid has a bright future. 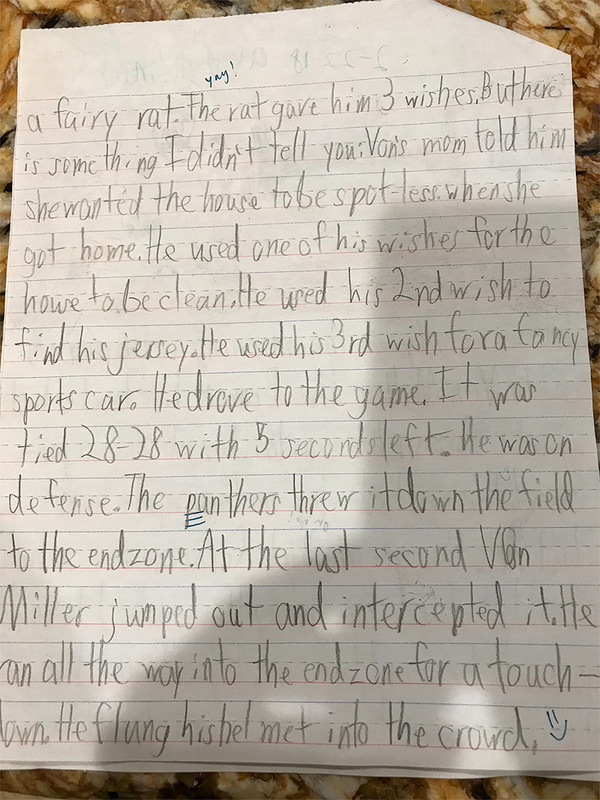 I knew it was a true story when I read, "Von's mom told him she wanted the house to be spot-less when she got home." Man, you just can't do it any better than that. Hope Von is able to read this young man's work. My reply to this post was deleted !!!!!!! Interesting how his story left out the part about him NOT STANDING for the NATIONAL ANTHEM !! !